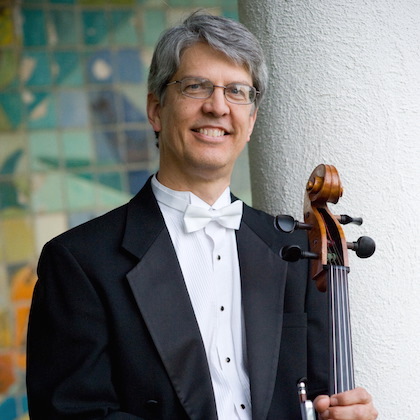 Mr. Champion has been Artist Teacher of cello at the University of Redlands since 1995 and has served on the faculties of La Sierra University, California State Polytechnic University (Pomona), Oklahoma City University and Oklahoma Baptist University. He was appointed Director of the University of Redlands String Project in Fall 2011. He serves as principal cellist with the Redlands Symphony and was former principal cellist with the Riverside County Philharmonic and the Chamber Orchestra of Oklahoma City. He is a member of the Long Beach Symphony, and regularly performs with numerous area orchestras including Pacific Symphony, Los Angeles Opera, and San Bernardino Symphony. He rounds out his performing schedule in recording studios and by playing chamber music recitals with the cello quartet Quatracelli. He was recently appointed String Specialist at the Webb School of California in Claremont, California. Mr. Champion was a student of Ronald Leonard at USC and has studied chamber music with Donald McInnes, members of the New Hungarian String Quartet and the contemporary music performers, Voices of Change.